it a dull book (as such books generally after 1 became capable of rational inare), and perhaps to laugh at it. But quiry.“ | and born there about 1600. He was a disciple of Coperario. In 1625, he became a gentleman of the chapel royal; and was afterwards appointed one of the private music to Charles f. In 1653, were published his” Ayres and Dialogues," &c. folio, with a preface by himself, and commendatory verses by the poet Waller, Edward and John Phillips, nephews of Milton, and others. 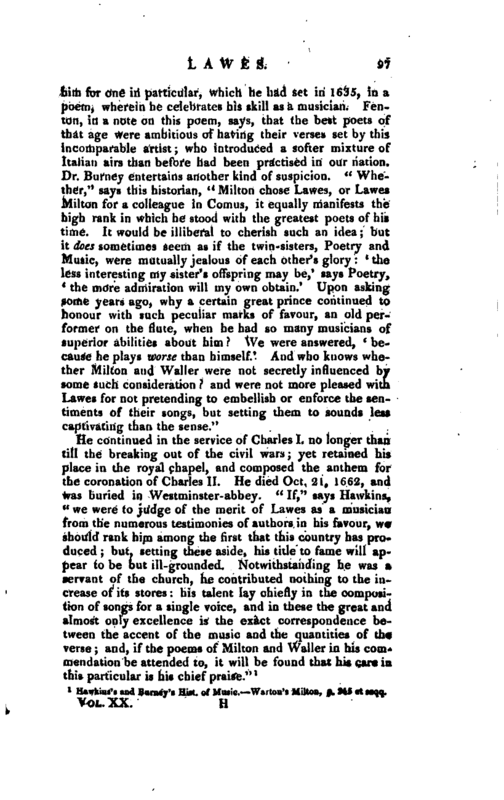 In the preface, speaking of the Italians, he acknowledges them in general to be the greatest masters of music; yet contends, that this nation has produced as able musicians as any in Europe. 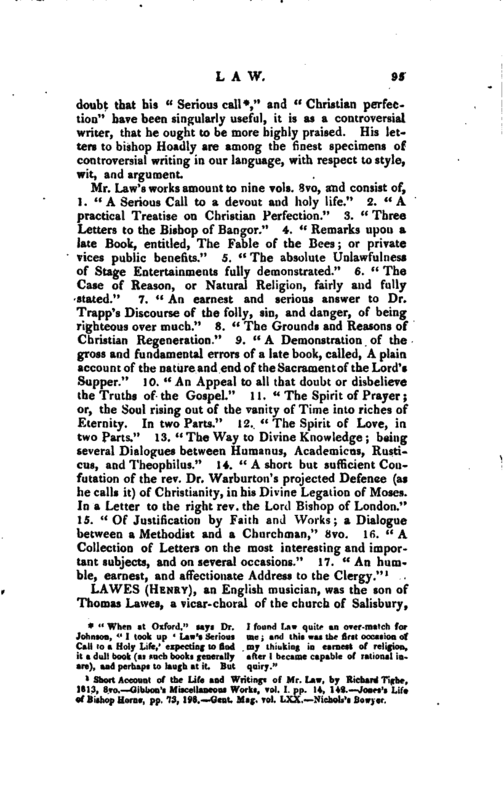 He censures the fondness of his age for songs in a language which the hearers do not understand; and, to ridicule it, mentions a song of his own composition, printed at the end of the book, which is nothing but an index, containing the initial words of some old Italian songs or madrigals: and this index, which read together made a strange medley of nonsense, he says, he set to a varied air, and gave out that it came from Italy, by which it passed for an Italian song. In the title-page of this book is a very fine engraving of the author’s head by Faithorne. 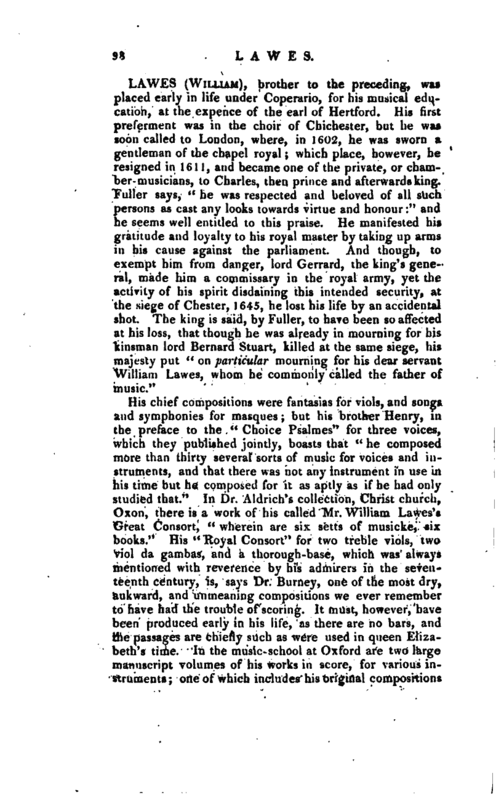 Twenty years before, in 1633, Lawes had been chosen to assist in composing the airs, lessons, and songs of a masque, presented at Whitehall on Candlemas-night, before the king and queen, by the gentlemen of the four inns of court, under the direction of Noy the attorney- general, Hyde afterwards earl of Clarendon, Selden, Whitelock, and others. 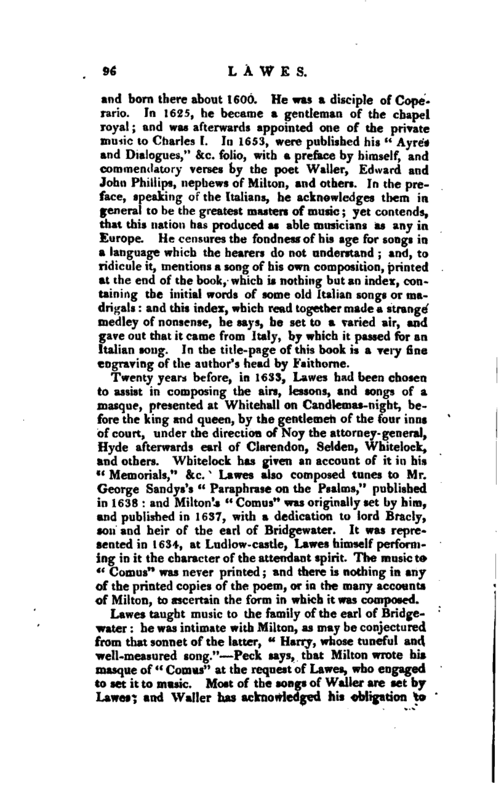 Whitelock has given an account of it in his “Memorials,” &c. Lawes also composed tunes to Mr. George Sandys’s “Paraphrase on the Psalms,” published in 1638: and Milton’s “Comus” was originally set by him, and published in 1637, with a dedication to lord Brady, son and heir of the earl of Bridgewater. It was represented in 1634, at Ludlow-castle, Lawes himself performing in it the character of the attendant spirit. The music to “Comus” was never printed and there is nothing in any of the printed copies of the poem, or in the many accounts of Milton, to ascertain the form in which it was composed. 1 Hawkins’s and Bumey’s Hist, of Music. Wartou’s Milton, p. 345 et seqq.